Chill your glass in the freezer. Pour all the ingredients into a cocktail shaker with one cup of ice and shake until well chilled. 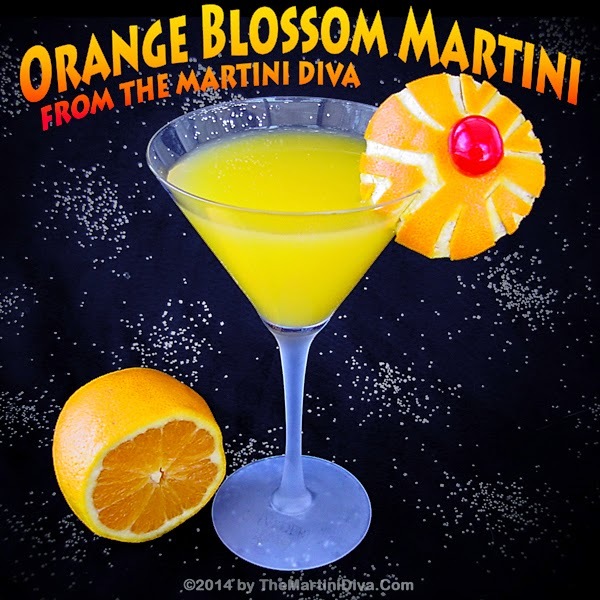 Pour into your martini glass garnish with a decoratively carved orange twist, the edible orange blossom (optional) and enjoy. 4:55 am Okay, brunch booze has been handled, obligatory blog photo taken. Now I have to create the edibles from my sad little larder & fridge with just some eggs, milk, sour cream, stale bread, cheese and sausage. A Breakfast Strata it is. Yeah, the carved orange garnish is not perfect - gimme a break it's not even 6 in the morning yet! There better be a serious hostess gift coming my way is all I can say. P.S. National Orange Blossom Day is June 27th. Now I have a cocktail for it! *My not quite awake quip on the old Have Gun Will Travel - Palladin TV Show from the fifties.